Published on March 6, 2009 in About Holy Cross. Closed Tags: Add new tag, Anglican Communion, episcopal church. Holy Cross is part of the Episcopal Church, which is a member of the worldwide Anglican Communion. Like Roman Catholics, we have sacraments, bishops and priests, the Eucharist on Sunday, and many other traditional elements. On the other hand, we have no centralized authority like the Pope, women share equally in all roles in the church (including bishop and priest), clergy may marry (our vicar has a wife and two grown children), and there is in general great leeway for individual beliefs and interpretations. Published on March 5, 2009 in About Holy Cross. Closed Tags: Add new tag, baptism. 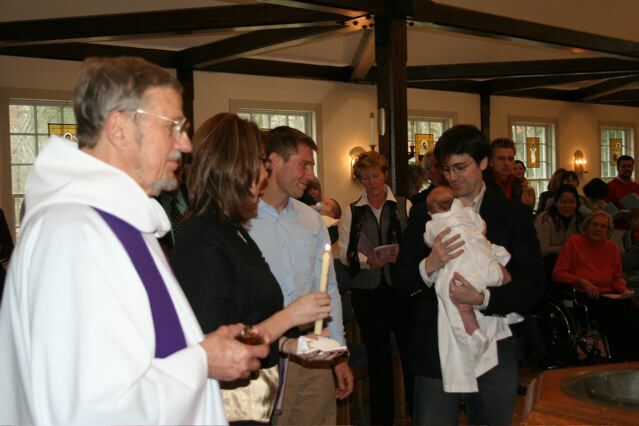 Bishop Arthur Walmsley prepares to chrismate a newly baptized infant. Published on March 4, 2009 in About Holy Cross. Closed Tags: Add new tag, marriage, weddings. 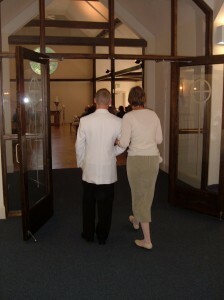 Marriage is a sacrament and a life, not just a wedding.